Do you use seasonal writing prompts with your children? If so, these FREE Winter Story Starters are perfect for helping your young writers get their creative juices flowing. Seasonal writing prompts are a great way to incorporate seasons and holidays into your everyday writing. They are sure to get your kids’ creative juices flowing! 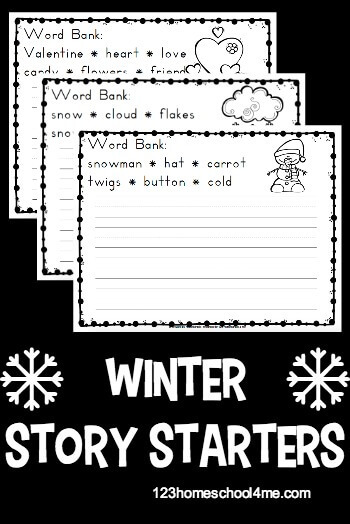 These winter writing prompts are sure to be a hit with your young writers. They’re perfect for older preschoolers, kindergarteners, and young first graders. The no-prep writing prompts are easy to add to your writing time. Just print and go! Print out each of the writing prompts (pages 3- 9). I suggest printing page 10 on the back of each of those pages. This allows more seasoned writers more space to continue their story on the backside. Instead of story starters, these writing pages include a picture prompt. Children can color these pictures to match their stories if they’d like. Each page includes a word bank. 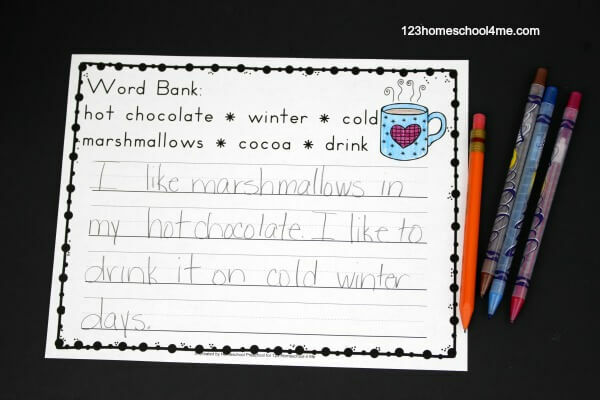 The word bank includes words that go along with each picture. Children shouldn’t be required to use each word. They are included for inspiration and for spelling help. At the end of this pack, there is a page of word cards. This page can be cut into individual word cards or left whole. Children can use these cards for additional word inspiration or spelling practice as they write their stories.